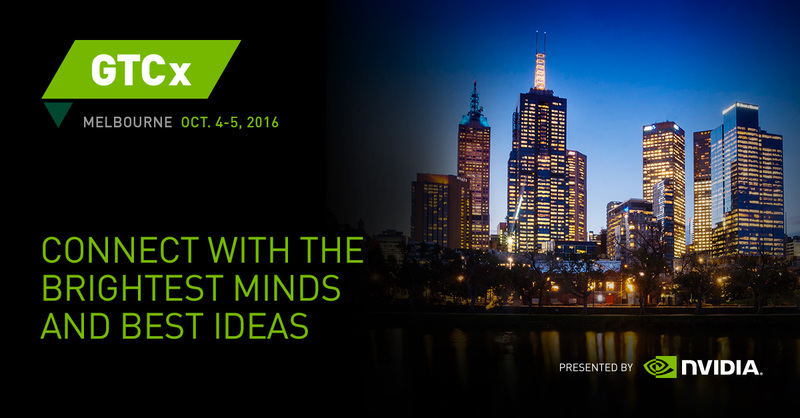 Melbourne Australia, 15 September 2016 — Step into a virtual world and experience how virtual reality (VR) is driving research, applications and games at GPU Technology Conference Extension (GTCx) Australia on October 4 and 5, 2016. Set up conjunction with the conference, the VR Village will feature VR rooms and kiosks where participants can try out the latest demos running on HTC Vive and Oculus. These demos include NVIDIA’s very own carnival game Funhouse, Everest, Iray Lightfield, Iray VR Panoramas, Endeavor Point Cloud, Bullet Train, and Earthlight VR, a first person space explorer game developed by Melbourne-based Opaque Multimedia. NVIDIA will also host a Deep Learning CDO (chief data officer) Roundtable with the theme “Next-Generation Analytics, Deep and Machine Learning with GPUs”. This session will discuss how CDOs of data intensive companies can leverage NVIDIA GPUs to undertake machine and deep learning. Those keen to learn more about deep learning can take part in the NVIDIA Deep Learning Institute. They can discover how advanced deep learning techniques are being applied to rich data sets to help solve big problems. Upon completion of the NVIDIA Deep Learning institute lab, participants will receive a certificate of attendance and free online training credits. Twenty shortlisted submissions of research posters from both academia and industry, describing ongoing GPU-enabled research, exciting new research projects, and encouraging preliminary results, will be exhibited electronically. The Best Poster award winner will get a fully paid trip to GTC US next year and NVIDIA hardware. GTCx Australia is an extension of GTC, the world’s largest and most important event for GPU developers held annually in San Jose, United States. To be held at Melbourne Convention and Exhibition Centre, the event is designed for C-level, professionals, developers, and researchers across many industries — from finance and big data analytics to academia and entertainment. Themed “Deep Learning AI Revolution -The Next Computing Platform”, it will feature keynote addresses and three tracks covering accelerated computing, Pro VR/Pro Viz and deep learning.